The color blocking trend has been around for awhile now and I think its pretty safe to say its not going anywhere anytime soon! 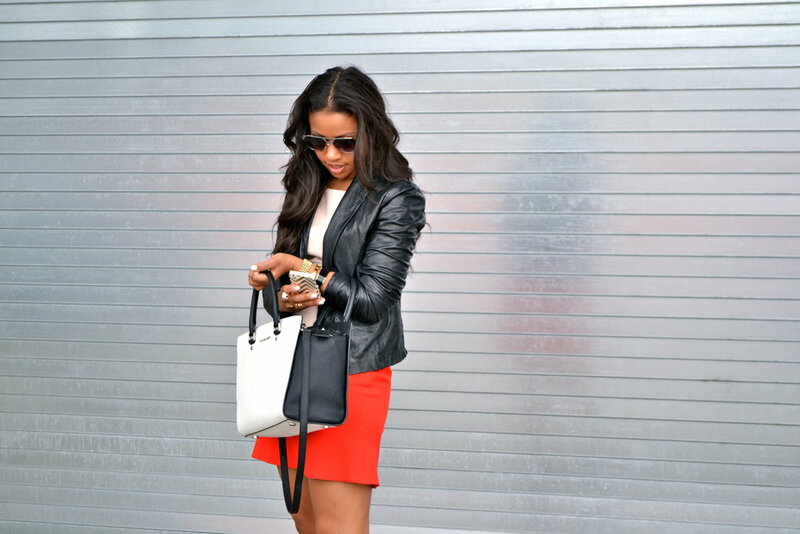 Currently I'm loving a modern black & white, mixed with a bold color, in this case a nice coral-red, so chic! Add a basic black pump, aviator sunglasses, a leather jacket, and a statement piece of jewelry (I chose a jeweled snake ring) and your all set! What I really love about this look, is with the jacket its perfect for work but without the jacket it transitions nicely to drinks with my girls or date night with my BF.